Welcome to the Evolute Newsletter - November 2015 edition. We have some exciting announcements and news for you. It's been a while since we last updated you regarding our ongoing developments on EvoluteTools. In the meantime we have been developing some amazing new features for EvoluteTools PRO, EvoluteTools D.LOFT, and EvoluteTools T.MAP. Find out more about it below. Nearly one year after releasing our first build of EvoluteTools T.MAP we are proud to present our final public beta build before EvoluteTools T.MAP goes commercial on January 1st, 2016. In the recent months we implemented major improvements to the algorithms and GUI, fixed bugs, and improved the workflow to make EvoluteTools T.MAP an easy to use and must-have tool for remeshing, texture- and pattern-mapping. With this final beta build of EvoluteTools T.MAP, we also want to thank our big beta user community for their support and feedback. Please update to the latest build and keep using and testing T.MAP, and most importantly, give us feedback on how it works for you! Existing beta users will automatically receive download links through the T.MAP plug-in, new users can download from here. Thank you again and we hope you like T.MAP as much as we do. What is EvoluteTools T.MAP and what does it do? We recommend to use these publicly available benchmark models for test purposes (obj files, 500mb). Read more about this latest update on our blog and download it from here. The commercial release of EvoluteTools T.MAP will be available from January 1st 2016 and will cost EUR 395,-. Customers who pre-order EvoluteTools T.MAP before December 31st, 2015 for EUR 295,- will be the first ones to receive the commercial build on January 1st, 2016. Be one of the first to get EvoluteTools T.MAP for a special price, buy your license now. Don't hesitate to contact us for any further questions! We have just updated the user interface for a more intuitive and flexible experience, and improved speed by orders of magnitude. In the new release of EvoluteTools D.LOFT, one can observe the surface become developable in real-time! Every step of the way, the solution is redrawn, smoothly moving the rulings along the curves until D.LOFT finds a developable solution matching the input constraints. Watch the lofting action live and get more insight on the D.LOFT's process. Have better control over how to achieve your goals. Read more about this latest update here. Download an evaluation version from our website. Or watch our sneak peaks on YouTube. What is new in EvoluteTools PRO: We will introduce you to two new features that are included in the latest release of EvoluteTools PRO. 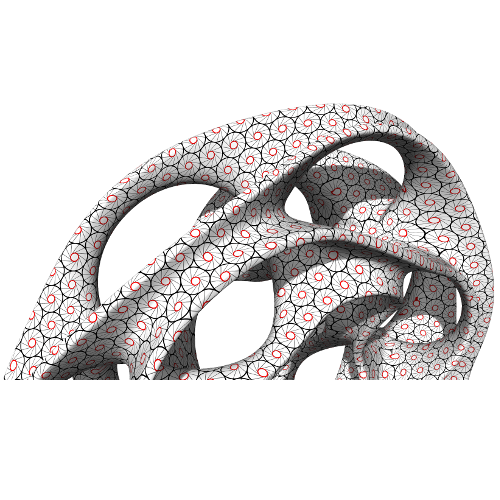 The new etMeshGeodesic command adds a feature that was long overdue: exact geodesic curves on meshes! Among the curves drawn on a surface, geodesics are those that follow the straightest path. On a flat surface, geodesic curves are straight lines, while on a sphere the are the great circles. 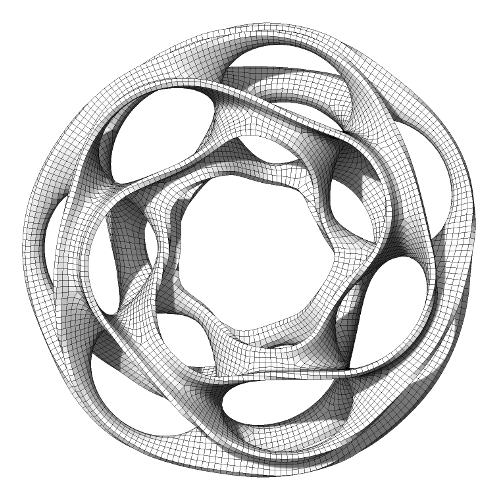 pick any two points on a given mesh and EvoluteTools PRO computes a geodesic curve between them. points can be picked anywhere on the mesh, including vertices but also inner points picked within mesh faces. Read more about these latest changes here. 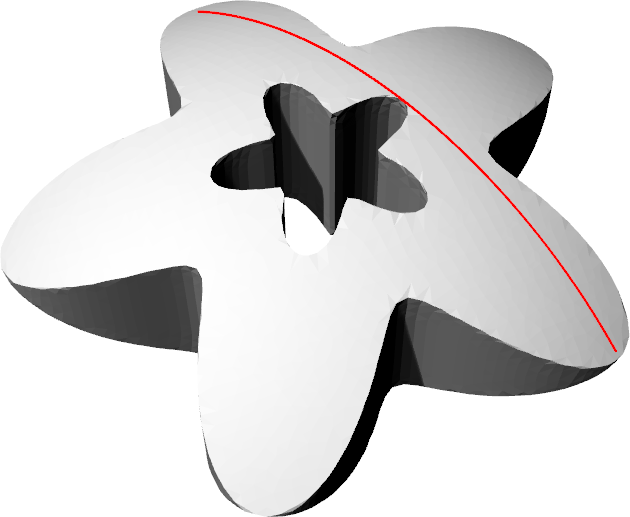 EvoluteTools PRO has long had the ability to optimize the edges of a mesh towards a unique length. At best, this optimization option will result in a mesh whose edges all have the exact same length. Most of the time this configuration is impossible for geometric reasons, in which case the optimization will simply make the edge lengths as uniform as possible. The latest release of EvoluteTools PRO release will extend this functionality. assign each edge of a mesh to a specific group, according to the desired length. or it can be left to the optimization process to determine the ideal length. have the command help you by optimaly assigning the edges to edge length groups. Check out examples on our blog. Evolute develops the most comprehensive paneling solution available to date. Built on a highly versatile and extremely powerful optimization engine, fully packed with features, proven on many of today's architectural landmarks and able to tackle intricate panelization challenges in a fast paced design process. We are now bringing the core module Panel Design and optimization of EvoluteTools PRO to you at a strongly reduced rate, including the features described above among many others. You want to give us feedback? We welcome any and all feedback. Don't hold back!